The world's first coins were created in Lydia and Ionia from a gold and silver alloy; each coin had a predetermined weight. The weight of United States coins is also predetermined. The penny, nickel, dime, quarter and half dollar weigh 2.5 grams, 5 grams, 2.268 grams, 5.67 grams and 11.340 grams, respectively. 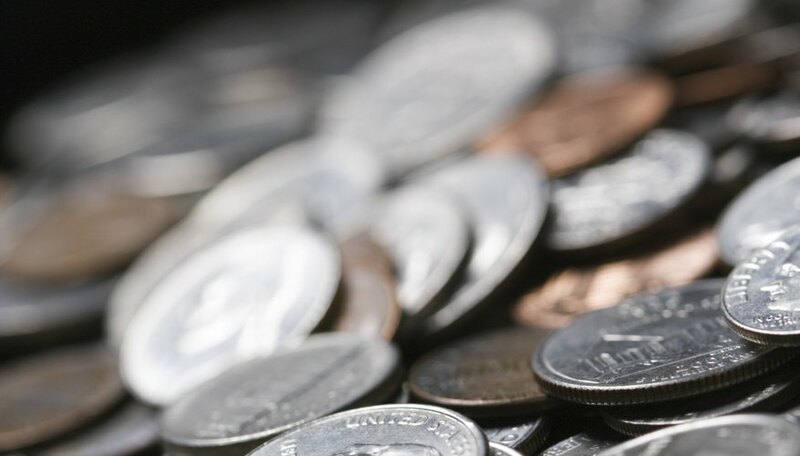 One method for accurately counting coins is to separate and count them by weight and size. Cut, using a utility knife, a cardboard box to a length of 12 inches and a height of 8 inches. Position the box horizontally (landscape orientation). Use the handsaw to cut a 1-inch-by-1-inch wood plank to a length of 12 inches. Place the left end of the wood plank on the left side of the cardboard piece. Place the right end of the wood plank on the right side of the cardboard piece. Use the protractor to position the wood plank at a 45-degree angle. Glue the wood plank to the cardboard piece with a hot-glue gun. The coins will roll down the wood plank along the cardboard piece. Cut holes above and parallel to the wood plank. Make the first hole 2 inches by .705 inches (a dime's diameter is .705 inches). Make the second hole 2 inches by .75 inches (a penny's diameter is .75 inches). Make the third hole 2 inches by .835 inches (a nickel's diameter is .835 inches). Make the fourth hole 2 inches by .955 inches (a quarter's diameter is .955 inches). Make the fifth hole 2 inches by 1.205 inches (a half dollar's diameter is 1.205 inches). Place the first hole 1 inch from the right edge of the cardboard box. Cut 2-inch-by-2-inch cardboard boxes to the height of each hole. Cut the ends off each box; only the sides of the boxes should remain. Glue the boxes to the back of the cardboard piece using a hot-glue gun. Place a 2-inch-by-2-inch hand scale under each cardboard box. There should be a total of five hand scales and five boxes; the tops of the hand scales should be level with the bottoms of the cardboard boxes. Make a chart multiplying the weight per coin. For example, make a chart with 2.5 grams = 1; 5 grams = 2; 7.5 grams = 3; 10 grams = 4. Attach it to the back of the penny cardboard box. Tilt the cardboard piece inward so the coins fall into the appropriate boxes. Place a coin on the top right of the wood panel. Release the coin. The coin should travel down the wood panel and, based on its size, fall into the appropriate box. The scale tells the weight of the coin. The chart counts the number of coins you have. Use caution when handling a hot-glue gun. The tip of the gun is extremely hot. Wear protective gloves, goggles and mask when using a handsaw.